"Nanopatterned Textile-Based Wearable Triboelectric Nanogenerator"
From light-up shoes to smart watches, wearable electronics are gaining traction among consumers, but these gadgets’ versatility is still held back by the stiff, short-lived batteries that are required. These limitations, however, could soon be overcome. In the journal ACS Nano, scientists report the first durable, flexible cloth that harnesses human motion to generate energy. It can also self-charge batteries or supercapacitors without an external power source and make new commercial and medical applications possible. 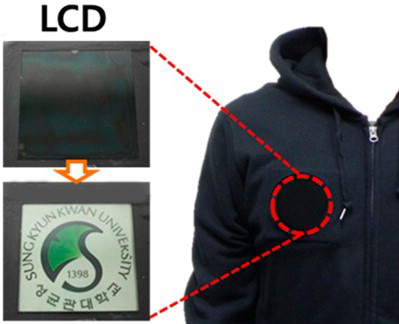 Sang-Woo Kim and colleagues point out that the potential of wearable electronics extends far beyond the flashy and convenient. Small, lightweight devices could play life-changing roles as robotic skin or in other biomedical applications. But to maximize their utility, such electronics need an ultra-flexible, long-lasting energy source that is seamlessly incorporated into the device’s design. For a possible solution, Kim’s team turned to the emerging technology of “triboelectric nanogenerators,” or TNGs, which harvest energy from everyday motion. The researchers created a novel TNG fabric out of a silvery textile coated with nanorods and a silicon-based organic material. When they stacked four pieces of the cloth together and pushed down on the material, it captured the energy generated from the pressure. The material immediately pumped out that energy, which was used to power light-emitting diodes, a liquid crystal display and a vehicle’s keyless entry remote. The cloth worked for more than 12,000 cycles. A new kind of material can harness energy from human movement and use it to light up a small LCD display.